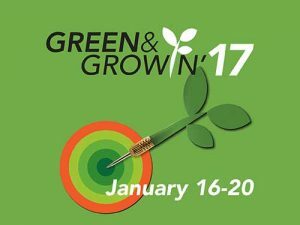 The North Carolina Nursery & Landscape Association (NCNLA) has opened registration for Green & Growin’ 2017. The educational program and trade show is scheduled for Jan. 16-20 in Greensboro, N.C.
“Building on our landmark 2016 event, we poured over all the comments and ideas from attendees and have put their suggestions into action,” said NCNLA Board of Directors President Brad Rollins. For the keynote addresses, attendees will hear from speaker and coach Jason Golberg, who will discuss the “Art of Self-Leadership,” and economist Charlie Hall, Ph.D., who will speak on the past, present and future of green industry economics. The education and certification schedule includes budgeting and estimating classes, pesticide license classes and test and paver installer certification courses. The education sessions also feature Spanish pesticide license classes and an exam, sponsored by the National Hispanic Landscape Alliance. The trade show on Jan. 19-20 will be held at the Greensboro Coliseum Complex, while the educational sessions Jan. 16-19 will be held the Sheraton Greensboro at Four Seasons. Register online here and view the schedule of events here. Dillon Stewart graduated from Ohio University’s E.W. Scripps School of Journalism, earning a Bachelor of Science in Online Journalism with specializations in business and political science. Stewart is a former associate editor of LM.